I had in mind to do a pumpkin soap for more than a month ago. I weighted and saved the pumpkin puree in the freezer and waited to spare 1 hour of my time to actually do it. It took one month to find this time until I said it shouldn't wait for longer. Well, I prepared everything and launched myself in actually doing it. Everything went smoothly, the preparation of the lye, the mix of the oils, the essential oils and one of the coloring. As the uncolored part was not that orange, I wanted to add some more food coloring to reach a pumpkin color. Just when I added the color and turned on the blender to mix it, my blender decided to reach its end life. The soap was enough thick and adding this jelly yellow color was a bad choice. I've tried without success to mix manually the color, you can still see some concentrated spots of color. Finally I gave it up and let it like that. The result is this soap with spots of yellow-orange color that was not mixed. Not totally a disaster but that's it, I couldn't do it better. 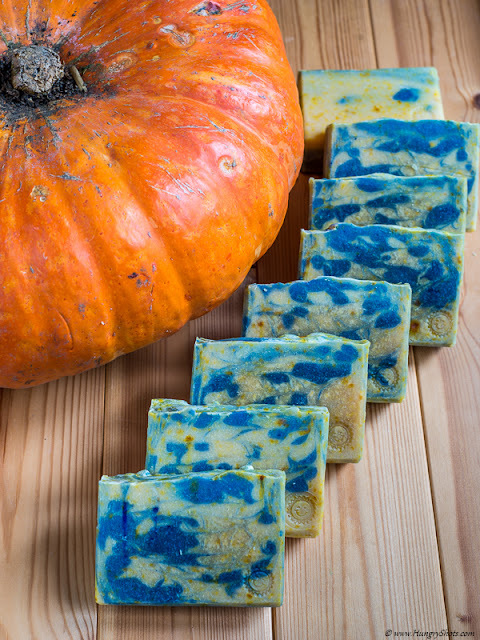 What I liked with this soap is that it maintained a nice blue color and didn't turn to green after saponification. The light scent of cloves makes the soap lovely to use it for washing your hands regardless the nonuniform yellow color.